Generic Xyzal (Oriel tablets) is used for the relief of symptoms associated with seasonal and perennial allergic rhinitis. Levocetirizine tablets are also used for the treatment of the uncomplicated skin manifestations of chronic idiopathic urticaria. Oriel tablets are manufactured by Intas Pharmaceuticals Ltd. in the strengths of 5 mg.
We also have in stock Levorid-D tablets, manufactured by Cipla Ltd., which is another medication used for the same indications. 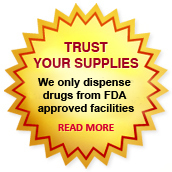 We supply original Oriel tablets manufactured by Intas Pharmaceuticals Ltd.. The active ingredient present in Oriel tablets is Levocetirizine Hydrochloride . Each tablet of Oriel contains 5 mg of Levocetirizine. Levocetirizine HCl is the 3rd generation non-sedative antihistamine following the popular brands Zyrtec® & Reactine®. It is used to treat symptoms of year-round perennial allergies (sneezing, stuffy nose, runny nose and itching of the nose) in adults and children who are at least 6 months old as well as seasonal allergies in adults and children who are at least 2 years old. It is an antihistamine that reduces the natural chemical histamine in the body. Histamine can produce symptoms of sneezing, itching, watery eyes, and runny nose. The block buster drug Cetirizine sold under the brand names of Zyrtec® & Reactine® reached an all time high sales in 2008 but has since dropped as the 3rd generation composition Levocetirizine is becoming globally known. Levocetirizine is found to be more effective and with less side effects making it the future block buster antihistamine. Take Oriel tablets as prescribed by your doctor. Do not use it in larger amounts or for longer than recommended. The most common side effects of Levocetirizine tablets (Generic Xyzal) with an occurrence rate of 2% or more and greater than placebo were somnolence, nasopharyngitis, fatigue, dry mouth, and pharyngitis in patients 12 years of age and older, and pyrexia, somnolence, cough, and epistaxis in children 6 to 12 years of age. Symptoms of Levocetirizine overdose may include drowsiness in adults and initially agitation and restlessness, followed by drowsiness in children. There is no known specific antidote to Generic Xyzal. Should Levocetirizine overdose occur, symptomatic or supportive treatment is recommended. Levocetirizine tablets are contraindicated in patients with a known hypersensitivity to Levocetirizine or any of the inactive ingredients of Oriel 5 mg tablets or to Cetirizine. Generic Xyzal is also contraindicated in patients with end-stage renal disease at less than 10 mL/min creatinine clearance or patients undergoing hemodialysis. You should not use Generic Xyzal if you are allergic to levocetirizine or cetirizine (Zyrtec®). Do not take this medicine if you have end-stage kidney disease or if you are on dialysis. Any child under 12 with kidney disease should not take Levocetirizine. Tell your doctor if you regularly use other medicines that make you sleepy (such as other cold or allergy medicine, narcotic pain medicine, sleeping pills, muscle relaxers, and medicine for seizures, depression, or anxiety). They can add to sleepiness caused by Levocetirizine. Levocetirizine has been classified by the US FDA as Pregnancy Category B. There are no adequate and well-controlled studies regarding use of Levocetirizine in pregnant women. Because animal reproduction studies are not always predictive of human response, Generic Xyzal should be used during pregnancy only if clearly needed. Tell your doctor if you are pregnant or plan to become pregnant during treatment with this medicine. Cetirizine has been reported to be excreted in human breast milk. Because Levocetirizine is also expected to be excreted in human milk, use of Levocetirizine Tablets (Generic Xyzal) in nursing mothers is not recommended. Do not use this medicine without telling your doctor if you are breast-feeding a baby. Patients should be advised to avoid concurrent use of Levocetirizine tablets with alcohol or other central nervous system depressants because additional reduction in mental alertness can occur. You can buy Generic Xyzal tablets online from Clear Sky Pharmacy at a cheap price. Oriel 5 mg pills, manufactured by Intas Pharmaceuticals Ltd., India are supplied in a blister strip of 10 tablets. The 5 mg tablets cost only $0.20 per unit when you place an order for 240 tablets.